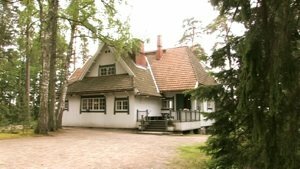 The documentary ”Sibelius and Luonnotar” (28 min.) tells about the symphonic poem ”Luonnotar” by composer Jean Sibelius, and about its source of inspiration, the first song of the Kalevala epic that is an origin myth depicting the birth of the world and the tale of Maiden of Nature, Luonnotar. Researcher Timo Virtanen tells about how this composition by Sibelius for soprano and symphony orchestra was created, about the role of Aino Ackté as the first performer of the work, about the musical character of this composition and the influence of folk tradition on the composing work of Sibelius. Academician Anna-Leena Siikala tells about the worldview of Kalevala, about the origin myths depicting the birth of the world and the female goddesses associated with these primal myths. Researcher Jouni Hyvönen tells about the birth of the Kalevala epic, about the gathering of poems and songs and about the writer of Kalevala, Elias Lönnrot. Soprano Riikka Hakola contemplates on the interpretation of the vocal parts, on the narrative of the story and the central role of women in the origin myth of Kalevala. Conductor Leif Segerstam analyzes the composition and its structure. Riikka Hakola and Leif Segerstam discuss on the interpretation and atmosphere of the music piece. The interviews of the documentary proceed side by side with the music recording of the composition. The music was recorded in Bratislava in December 2006, performed by soprano Riikka Hakola, conductor Leif Segerstam and the Slovak Radio Symphony Orchestra. The documentary “Sibelius and Luonnotar” has been scripted and directed by Marikki Hakola, shooting by Raimo Uunila, sound design and mixing by Epa Tamminen. The production has been supported by ESEK/LUSES AV Division and Finnish Cultural Foundation. The production has been realized in co-operation with YLE Teema and YLE Co-Productions. The producer in charge is Marikki Hakola. The production company is Kroma Productions Ltd. Finland.